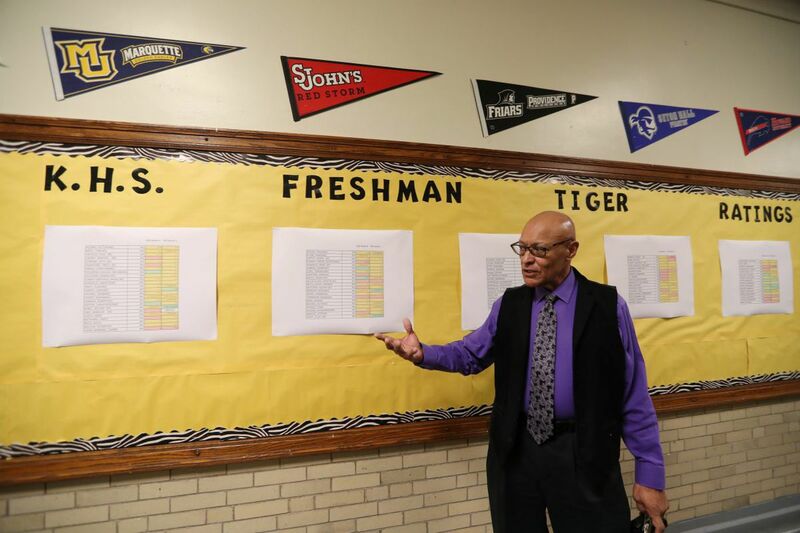 Principal Jose A. Lebron discusses the ninth grade progress wall at Kensington High School. Destiny Kobel had a vague idea of what high school would be like, and, frankly, she was frightened before she launched into her freshman year at Kensington High in September. "I thought it was going to be scary," said Kobel, 14. "I thought it was going to be hard." But things have gone much better than planned; classes have been manageable, with teachers she can relate to, trips and activities, and a constant push to stay on target academically and personally. She chalks that up to her experience in Kensington's ninth grade academy — essentially a school within a school, where freshmen have a dedicated group of specially selected teachers and extra supports. For the Philadelphia School District, ninth-grade academies are an area of focus and a planned $7.2 million investment next school year. Destiny Kobel (left) and Alyssa Morales discuss their freshman year experience at Kensington High School. In the race to high school graduation, ninth grade is make-or-break time: Finishing freshman year on schedule is the strongest predictor of whether a student will earn a diploma in four years, research shows. And in a city where one-third of all high school students do not graduate on time, strategies to get teens to the finish line are important. "The transition from eighth grade to ninth grade is where we lose our kids," said Jose Lebron, a 40-year education veteran and Kensington's principal. Schools around the region and across the country, particularly those in urban areas, have zeroed in on freshman year as a time to catch kids — or else. Nineteen Philadelphia comprehensive high schools now have ninth-grade academies; for the 2018-19 school year, 27 high schools will have them. Cheryl Logan, who until recently was Philadelphia's chief academic officer, believes a focus on ninth graders is the path to Superintendent William R. Hite Jr.'s target of an 80 percent graduation rate by 2021, up from 67 percent in 2017. "For years, the strategy has been backward: We put all of our investment dollars in credit recovery and reengagement," said Logan, recently named the next schools superintendent in Omaha, Neb. "There's only one place to invest in raising the graduation rate, and that's ninth grade. The issues are a lot less complex when kids are 14 than when they're 19." Kensington is in its second year of the model, and it has made a marked difference, said Lebron, who is in his third year as principal. The district dollars have given the school an assistant principal dedicated solely to ninth grade, a college and career readiness coordinator, and climate supports to focus on student behavior, and extracurricular opportunities. Ninth graders have their own floor in the building and their own entrance to the school, where staff members stand outside every morning to greet them. The school's strongest educators teach freshmen, who have 90 minutes of math and English class a day, and a "freshman seminar class" that offers lessons on skills Kobel and her classmates say are helping them adapt to high school: study skills, note taking, social and emotional lessons. At regular town hall sessions, issues are aired and victories celebrated. And all 159 pupils in the freshman academy can tell you exactly where they stand on the Kensington Tiger rating wall, a long bulletin board with bright yellow backing paper and the name of every student. Every week, teachers get together to confer and bestow separate marks (red, yellow, or green) for attendance, behavior, and academics, and to share insights about individual kids, to help keep them close — and to keep them publicly accountable, the ratings are posted for all to see. "If a student moves from neutral to negative, we need to know what's going on, we have to follow up," said Jamie Clark, Kensington's assistant principal for the ninth grade. Teachers make an effort to understand students' strengths and weaknesses even before they walk into the building — before school begins, staffers pore over pupil records from middle school to prep for what supports the teens might need. Assistant principal Jamie Clark discusses the ninth-grade academy at Kensington High. On Wednesdays, Alyssa Morales races to the bulletin board to check her marks. Positive marks come with rewards — trips, parties, other perks, and negative marks aren't just letters on a page. They come with feedback from staff on how to make changes – such things as "always wear full uniform," "use professional language," "show respect for everyone." "We all strive for positive," said Morales, 15. She was in neutral for academics, she said, but she had a plan to raise the bar. "I'm going to pay more attention in class, and I'm going to finish my work — all of it." Ana Ramirez, the college and career coordinator, meets with every student at least twice a year to develop individual plans for their academic careers and their future, and a road map to get there. "It's trying to change the culture, long-term, when it comes to graduation rate," said Ramirez. Nick Niedosik has taught in the imposing building on East Cumberland Street for 12 years, when it was the old Kensington High School, then when it became Kensington Business, and now, reformed as Kensington High again. As ninth-grade dean, Niedosik sees a marked improvement in culture because of the structure and supports of the academy, he said. "Some of our kids don't have a role model at home, but we make sure that everyone at school has some adult to talk to," said Niedosik. "I didn't see that when I taught other grades." A focus on ninth grade is not new, or unique to Philadelphia; Lebron used a ninth-grade academy so successfully when he led Edison High in the late 1990s and early 2000s that he also expanded the model to start a separate 10th-grade program. But education trends often come and go as administrations shift. Principal Jose Lebron visits a ninth-grade English 1 class at Kensington High. Still, when Hite asked Lebron to take the helm of Kensington to "clean the place up," Lebron said, he knew that a focus on a highly structured freshman year would be key to improving the school, which scored just 13 out of 100 on the district's internal report card for 2017. "In the past, we were just saying, 'Here's your roster, go and do your best,' and hope that they would make it. There were all kinds of ramifications, and nothing consistent," Lebron said. "Now, we're making meaningful progress. This is going a long way to getting our students up to par."